Patients who use oxygen can request an ILFA Medical Alert Card for their wallet, purse, bag or oxygen carrier. The Medical Alert Card should be completed by patients and contains information about your healthcare team and your oxygen company in case this information is needed in a medical emergency. 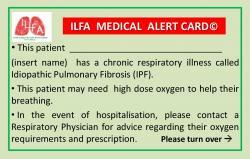 Contact ILFA by emailing info@ilfa.ie or calling 086 057 0310 to request your Medical Alert Card.